1. 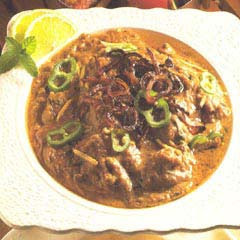 Marinate mutton(Lamb) with haldi, black pepper pwd, dhania pwd, paste of two onions and salt for 1/2 hr. 2. Heat Oil / Ghee and put the marinated mutton and fry it for few min's. 3. Now add the fried onion paste to the above, stir it. 4. Put 1 cup of water to the above mixture and cook it in a pressure cooker for 1/2hr with low flame and with whistle on. 5. After its done take the lid and put the gram masala and some dhania. 6. Can be served with roti or rice. Recipe Source: Adapted from a cookery show. Here's Wishing you a very Happy New Year Priya. May God bless you and your family with all the happy things in this coming year.